Beat eggs, oil, seasonings, and seltzer. 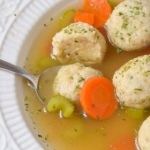 Add egg mixture into a large bowl with the matzo meal, mix until combined. Place into the refrigerator for about an hour. Roll into balls and place into a large pot with boiling water.